Violet Jessup was another great survivor. She survived TB as a child as well as two shipwrecks, including the Titanic! She also lived to a ‘ripe old age’. Strangely, Jessop’s story has been somewhat ignored in movies about the great ship. Born in 1887 in Buenos Aires, Argentina, Jessop was the oldest of five brothers and sisters. Her parents were Irish. Her mother came from a wealthy Dublin family who lived in smart Merrion Street. Her father was a sheep farmer. The family moved to England when Jessop was quite young and she went to a convent school. However, after her father died and her mother became ill, the young girl realised that she’d have to go to work. She decided to follow in her mother’s footsteps and work as a stewardess. This was the start of a long career on board ships. Jessop was only 21 and her attractiveness was often regarded as a potential problem because it might attract unwanted attention from passengers. Petite with grey-blue eyes and auburn hair, Jessop had to dress in drab clothes and wear no makeup when she went to one job interview. She got the position. Her first job was on the Orinoco in 1908. In 1910 she moved to the Majestic. She had to work 17 hour days for low wages on this ship. She was on the Olympic when it collided with HMS Hawke. Luckily, both ships were able to limp back to port. Although Jessop received several proposals from passengers, she only had one romance. This was with a warm-hearted, but opinionated Australian engineer called Ned. Unfortunately, he didn’t want to get married until he was promoted. This was a long way away and the pretty young stewardess didn’t want to wait. Jessop liked serving on the Olympic but friends persuaded her to join the Titanic even though she was concerned about the rough seas and wild weather. She dressed in a smart, ankle-length brown suit to join the ship. The 24-year old stewardess, a devout Catholic, was reading a Hebrew prayer when the iceberg hit. She was ordered up on deck and helped the passengers in her charge to go up to the deck. She was told to get into a lifeboat. A bundle – a tiny baby – was suddenly dropped into her lap. Eight hours later, she was picked up by the Carpathia. She felt the baby being snatched from her arms and she was very upset that she was never thanked by the baby’s mother. 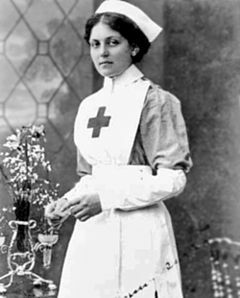 Jessop then became a Red Cross nurse on the Britannic. When this ship started sinking after being hit by a German mine, Jessop had to jump to safety. She was sucked under the keel which struck her head and she then found herself surrounded by severed corpses and badly injured men. She suffered headaches for years and learned later that she had had a fractured skull. Jessop thanked her thick reddish-gold hair for saving her life! The pretty stewardess did marry. Senan Moloney writes in his article, Violet's Barren White Star Wedding, that she married a fellow steward, John James Lewis, at 36 in London. The marriage lasted a very short time. One of her nieces thought that she never stopped carrying a candle for her handsome Australian. Surprisingly, Jessop continued to serve as a stewardess on ships until she was over 60. She then retired to a thatched cottage in Suffolk where she loved to garden. She died in 1971 aged 84.